YOUVILLE, CHARLES-MARIE-MADELEINE D’ (he regularly signed Ch. Youville Dufrost or Dufrost to distinguish himself from his brother Joseph-François, who signed Youville), parish priest and vicar general; b. 18 July 1729 at Montreal (Que. ), son of François-Madeleine d’Youville and Marie-Marguerite Dufrost de Lajemmerais; d. 7 March 1790 at Boucherville, near Montreal. Charles-Marie-Madeleine d’Youville was barely a year old when his father died in 1730. 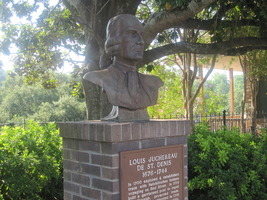 After 1742 he studied at the Séminaire de Québec, and on 26 Aug. 1752 he was ordained priest. Two years later he was appointed parish priest at Saint-Joseph-de-la-Pointe-de-Lévy. 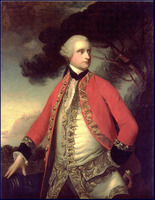 In July 1759 Major John Dalling took him prisoner during a retaliatory raid against the Canadians, who were carrying on guerrilla warfare, and he was held until September. In November he left his parish for the Government of Montreal. He had refused to collaborate with Governor James Murray, and in February 1760 Bishop Pontbriand [Dubreil*] confirmed that d’Youville would not return to his parish. He took refuge with his brother Joseph-François, who was parish priest at Saint-Ours, and then succeeded Louis Lepage* de Sainte-Claire as parish priest at Sainte-Rose, Île Jésus. In October 1761 he took up his post at Saint-Joseph-de-la-Pointe-de-Lévy again, and the following spring he made his peace with Murray. 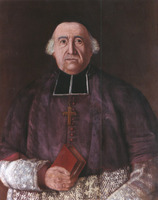 In 1774 Bishop Briand put him in charge of the parish of Boucherville; he also served as vicar general for the District of Montreal from this date. Throughout his ministry d’Youville enjoyed his bishop’s confidence. He was very young, just 25, when Bishop Pontbriand gave him his first parish, and in 1762 he was asked to receive a wayward confrère into his home to assist in his rehabilitation – one of the few priests so called upon. Bishop Briand held him in high esteem, as did Bishop Hubert, who appointed him vicar general in June 1788. D’Youville is also remembered as the first biographer of his mother, the founder of the Sisters of Charity of the Hôpital Général of Montreal called the Grey Nuns. He had watched the birth and growth of her life’s work, and he was the natural person to describe the various stages of its development. The tone of the biography is one of admiration, but in truth Mme d’Youville was quite exceptional. The document is interesting in other respects for the details it provides about the religious practices of the period, and through it d’Youville is revealed as a simple and sincere man. C.-M.-M. d’Youville is the author of “La vie de madame Youville fondatrice des Sœurs de la Charité à Montréal” and “Mémoires pour servir à la vie de Mde Youville et tirés pour la plupart des dépositions des sœurs Despins, Lasource, Rinville et de Mde Gamelin, et d’une autre sœur”; these manuscripts, held at the ASGM, were published as “La vie de madame Youville, fondatrice des Sœurs de la Charité à Montréal” in ANQ Rapport, 1924–25, 361–74. ASGM, Maison mère, Historique, Doc., 258, 259; Mère d’Youville, Famille, c/23–23.31 (includes some copies of documents held in the AAQ or ACAM). Allaire, Dictionnaire, I, 543. Carom “Inv. de la corr. de Mgr Briand,” ANQ Rapport, 1929–30, 50, 52, 109; “Inv. de la corr. de Mgr Hubert et de Mgr Bailly de Messein,” ANQ Rapport, 1930–31, 204, 209–10, 227. Desrosiers, “Cory. de cinq vicaires généraux,” ANQ Rapport, 1947–48, 111–12 (ten letters from Vicar General Youville Dufrost to Bishop Hubert). A.-H. Gosselin, L’Église du Canada après la Conquête. J.-E. Roy, Histoire de la seigneurie de Lauzon (5v., Lévis, Qué., 1897–1904), II, 268, 292, 302, 340–50, 360–61, 391, 416; III, 36–37. M. Trudel, L’Église canadienne. Claudette Lacelle, “YOUVILLE, CHARLES-MARIE-MADELEINE D’,” in Dictionary of Canadian Biography, vol. 4, University of Toronto/Université Laval, 2003–, accessed April 24, 2019, http://www.biographi.ca/en/bio/youville_charles_marie_madeleine_d_4E.html.